After a whole series of poor executed mainstream movies being released into the American cinemas, last weekend's release of Pixar's Ratatouille was a real breath of fresh air. 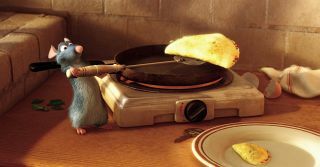 Ratatouille may be the ultimate foodie movie (perhaps even beating out Tampopo - only time will tell) and is both clever and original, but might not be as attractive to children as previous Pixar animations. For adults and food lovers, Ratatouille is the best movie Pixar has made so far. The story begins with Remy, a rat living in France who has a hypersensitive nose and a well developed palate. Because of his sense of smell, enhanced taste buds, and occasional viewing of cooking shows of the late television chef Gusteau, Remy won't eat garbage but endeavors to cook food. Through a series of misfortunes, Remy finds himself in Paris. 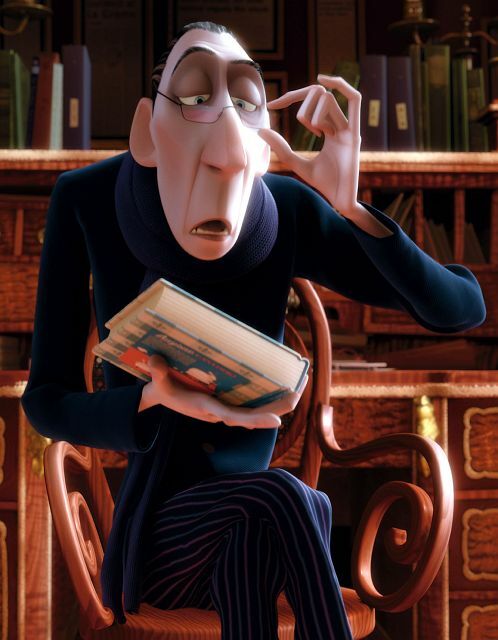 Not only in Paris, but in the kitchen of Gusteau's world famous restaurant, Gusteau's, which recently lost two out of five stars due to scathing reviews from the creepiest of all villains, a food critic (named Anton Ego). 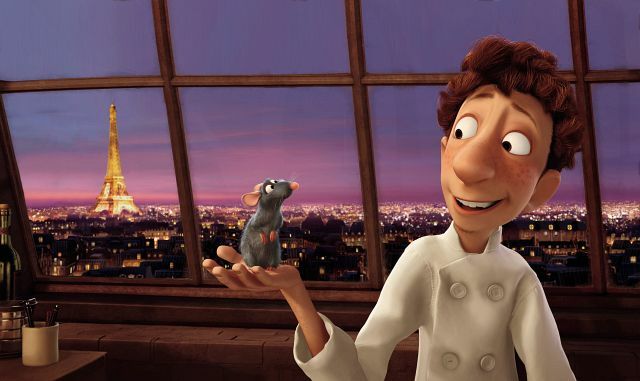 Remy, who can cook but is just a rat, teams up with a hapless garbage boy, Linguini Alfredo (who cannot cook), to return Gusteau's to it's previous splendor. Since Remy is a rat and Linguini is a garbage boy, this does not come easy. Pixar's animation team attended a bootcamp of sorts at Thomas Keller's The French Laundry to familiarize themselves with the world of haute cuisine and how a fine dining kitchen runs. (Thomas Keller even has a cameo and developed the signature dish served near the end of the movie.) The attention to physical details, kitchen hierarchy, and eccentric attitudes and relationships really shows as Remy and Linguini navigate Gusteau's kitchen. Animation-wise, everything is modeled impeccably. Water splashes are better than ever (but still need some improvements), copper pots are scratched and burnished, the grain of wood on mirror frames, spoons, and knife handles are natural and lovely to look at. Pixar's always been good at leading the industry in clothing and hair/fur animation, but Ratatouille brings that capability to a new level. Remy's fur clumps, singes, melts together at the tips (after a particularly sudden electrical storm), flattens, and drips when wet. In short, Remy's fur makes Sully's (from Monsters, Inc.) look like that of a stuffed animal. Special care was also taken by the animators to present clothing in a realistic fashion. The chef's outfits look good (especially one scene where Linguini is soaked and parts of his outfit cling to him and are a little transparent) but sometimes I felt like they were a bit stiff (perhaps this was intentional - the characters over starched their uniforms). The movements of all the characters are fluid and nothing feels exaggerated or strained. These days, most animation with bipedal characters are acquired through motion capture. Advancements in the last decade in motion capture technology has allowed movies with natural motions to be incorporated into them (like Final Fantasy: The Spirits Within, Polar Express, and King Kong) but sometimes the animated motions just don't feel perfectly natural. Pixar doesn't use motion capture to animate their models and somehow manage to make the characters move more realistically than if they did. It certainly allowed them to make extremely subtle motions with their characters that would not have been possible otherwise. Because of their skill, even when characters did impossible motions and poses, it still felt completely believable to the audience. 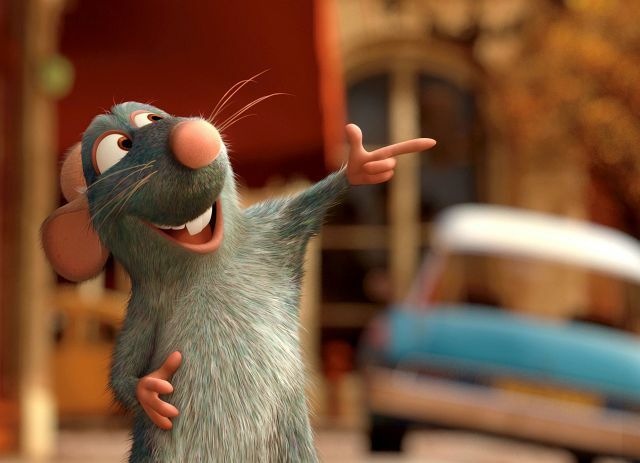 Even with these technical achievements, the real power of Ratatouille comes from the storyline. In a new twist on the typical "root for the underdogs" plot, Remy and Linguini truly capture your hearts as they struggle to prepare new flavor combinations while other plot against them and try to keep them from succeeding. In one exceedingly touching scene, I felt my eyes watering and could help thinking, "That's it. This is what food is all about and what it means to people. They got it." The only problem with Ratatouille is that it may not be as accessible to as wide of a population as Pixar's previous movies. The world of Parisian haute cuisine is familiar to a much smaller percentage of the world than, say, toys, tropical fish, or superheroes. Since most of the story revolves around food and food references and several characters have thick accents, the younger audience may get a little lost with this movie. Even so, the comedy and storyline of the movie is universal and the loss of the more esoteric of food references shouldn't detract from the enjoyment this movie provides. If you live to eat or have fond memories of good food, then Ratatouille is a must see movie. Subject: Can't wait to see it! I concur! Ratatouille was absolutely fantastic. Francophiles, food lovers, folks who have worked in restaurants, and those of us with a soft spot for watching rodents cook will love Ratatouille. The food critic angle was over my 6 year old's head but she loved it nonetheless. It was full of fantastic messages, without being preachy. After the film we went home and made ratatouille... used a pretty standard recipe from the internet (minus the eggplant as the store didn't have any)... garnished with grated port salut (a muenster would work well too, or romano/parmesan to take it in a different direction), accompanied by a rustic multigrain baguette (served sliced, stuck into the pasta bowls of the ratatouille). vinaigrette: hazelnut oil + a very light pomegranate vinegar + salt. An olive oil + light vinegar dressing would be just fine too. The sweetness of the raspberries and the overall light complexity of the salad was the perfect balance to the heavy, savory familiarity of the ratatouille. I think for wine we may have had a malbec. I agree; the film is brilliant, and I also got misty-eyed with the same thought - they GET it. They don't only appreciate quality in food, either. Near the end of the credits there was a little logo that looked like something you'd see on the menu of a chain restaurant, with a stylized picture of a proud man in a suit smiling and announcing "OUR GUARANTEE!" I don't remember the exact text, but it went something like "This picture contains 100% animation; no motion capture or fill-ins were used in it's production." I got a real kick out of that! I saw "Ratatouille" on the Fourth and was not impressed. It was your standard issue kids movie with none of the humor or cleverness we've come to expect from Pixar. The animation was fantastic, with special kudos to the water scene near the beginning. But the plot was predictable and I did not laugh once. It wasn't bad -- but it sure wasn't good. As for great cooking movies, what about "Big Night?" Great film, great cast. I just saw the movie tonight with my kids, and my daughter was talking at bedtime (and laughing hysterically) about the health inspector and chef getting thrown in the refrigerator. I must say, it wasn't overly funny, but it was highly entertaining. It's hard to devise or find storylines that are interesting and even humorous that aren't salacious. This story was original (even if it had echoes of Cyrano de Bergerac, which we'll allow because he was French too!) and refreshing. I mean, who was expecting the food critic to eat Ratatouille (of course, a clear reference to its rat origins) to enjoy it (which was predictable) based upon a reference to his commoner/populist upbringing? I wasn't. Additionally, any movie that can make rats be sympathetic characters deserves kudos! This was an excellent movie, and with its superior animation, it is a must see! Here is the recipe for confit byaldi (rattatouille) that Thomas Keller developed for and appears in the movie. Registration required for the NYTimes page. 1. For piperade, heat oven to 450 degrees. Place pepper halves on a foil-lined sheet, cut side down. Roast until skin loosens, about 15 minutes. Remove from heat and let rest until cool enough to handle. Peel and chop finely. 2. Combine oil, garlic, and onion in medium skillet over low heat until very soft but not browned, about 8 minutes. Add tomatoes, their juices, thyme, parsley, and bay leaf. Simmer over low heat until very soft and very little liquid remains, about 10 minutes, do not brown; add peppers and simmer to soften them. Season to taste with salt, and discard herbs. Reserve tablespoon of mixture and spread remainder in bottom of an 8-inch skillet. 3. For vegetables, heat oven to 275 degrees. Down center of pan, arrange a strip of 8 alternating slices of vegetables over piperade, overlapping so that 1/4 inch of each slice is exposed. Around the center strip, overlap vegetables in a close spiral that lets slices mound slightly toward center. Repeat until pan is filled; all vegetables may not be needed. 5. For vinaigrette, combine reserved piperade, oil, vinegar, herbs, and salt and pepper to taste in a bowl. 6. To serve, heat broiler and place byaldi underneath until lightly browned. Slice in quarters and very carefully lift onto plate with offset spatula. Turn spatula 90 degrees, guiding byaldi into fan shape. Drizzle vinaigrette around plate. Serve hot. I have to say, that I agree 100% with what Michael said. Ratatouille is hands down, the best movie I have seen this year, and even more so, the best Pixar movie for me (beating even The Incredibles, and I love Pixar movies). The movie reflects perfectly the world of restaurant kitchens, and the world of the people in them. I just loved Gusteau's philosophy, Remy's dreams and Collette's struggle. I just loved all about this movie. And the ending is incredible. It may not be perfect (and there certainly isn't a movie that is perfect) but incredibly enjoyable. Specially if you love food and cooking. being big fans of Pixar, we saw Ratatouille on opening day. Pixar is are an amazing creative force, both in animation and storytelling - their movies are original, fresh and smart. they also have a real reverence for the history of animation. I am a 51-year-old woman. I went to see Ratatouille with my two sons, 10 and 16 years old. We thoroughly enjoyed the movie. It was perfect family entertainment. My husband didn't go with us because he had low expectations, but I think the kids have convinced him to go, so hopefully we'll all go again before it's left the theaters. I just discovered your site yesterday--very nice! So I went looking for a recipe for ratatouille, and found your site. My wife is an electronics engineer, and I have a background in internetwork engineering. Serendipity ...or at least synchronicity...strikes again! Can anyone confirm re: the NYT recipe above.... AFAIKnew, from previously read recipe listings, piperade is something akin to scrambled eggs, but you throw in (most of) the listed vegetable ingredients along with the beaten egg into the pan. Right? Wrong? It's one of those foods that almost doesn't need a recipe, or even a terribly formal ingredients list, just a "get some x, y and z; beat x, chop a handful each of y and z, then drop in a hot pan and stir vigorously until firm. serve on toast" type affair. Also, haven't had chance to see but a little of the film; something like minutes 5-10 (in HD!) on my brother's new, huge TV in a random moment. Must say it was wonderfully capturing (the animation, particularly of Remy in full-on rat mode, just wow), clever and naturally very funny. Must find a moment to see it in full. Cars was entertaining enough but really something of a lull - this shows much more promise. The recipe quoted above is accurate. It matches the one the New York Times published for Thomas Keller's Confit Byaldi which was the Ratatouille dish featured in the movie. Subject: Fabulous for foodies AND for kids! I'm currently earning a degree in computer animation, and I have to agree that this was one of their most visually appealing films. Granted, the others have evolved. Has anybody seen Toy Story 3? The graphics are utterly amazing, especially compared to Toy Story (the original). I know they're coming out with more sequels for 2011 and 2012, including Monster's Inc 2. I hope they make a sequel to this movie. It sort of deserves one.